The post Monitoring User Session Activity With uberAgent appeared first on uberAgent. The post Learn About uberAgent at Virtual Expo, a Free Online EUC Event appeared first on uberAgent. We are proud to be a part of the xenappblog.com Virtual Expo event, one of the best resources for learning about cloud-based end-user computing from renowned industry experts. Virtual Expo is a one-day event where world-class presenters share their real-world experience in cloud and virtualization projects. They explain what works, and what does not. They share scripts and tools that worked well, and, probably most importantly, the lessons they learned, so that others can benefit. Best of all, everybody can join: Virtual Expo is a web-based virtual event, and it is free. Register now! Windows Virtual Desktop – what does it mean for Citrix? 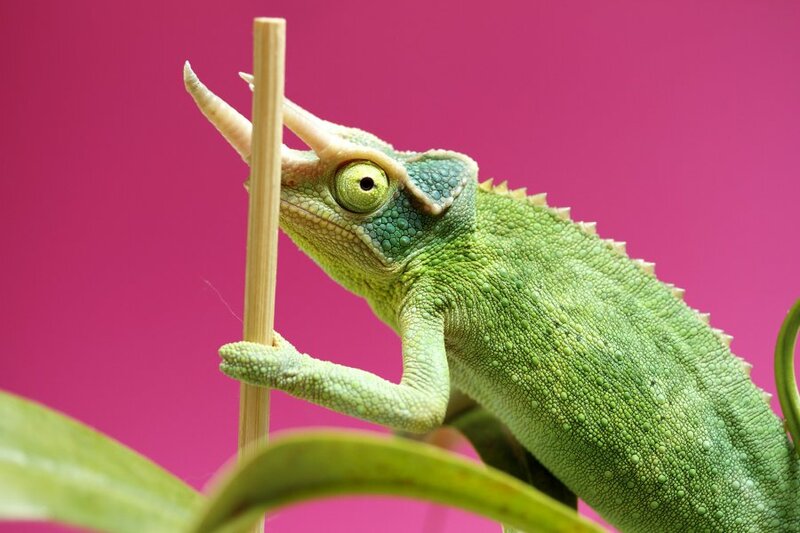 Have you ever wondered what those Citrix consultants know that you don’t? What are their secrets? Register now and enjoy the show! The post Swiss Insurance Relies on uberAgent. You Can, Too! appeared first on uberAgent. Infrastructure migrations are hard. Citrix migrations are harder. There are large numbers of moving parts, many of which are replaced or upgraded in a migration: server hardware, operating system versions, Citrix components, line of business applications. For such a project to be successful, it is vital to have a clear understanding of what you are dealing with. uberAgent’s application inventory and usage functionality not only tells you what is installed but also what is used, when and how often. Before new hardware can be ordered, sizing and capacity calculations need to show exactly what is required to find the perfect mix of CPU, disk and memory resources for your workloads. During the pilot phase, you might want to compare the new platform’s performance with your existing solution to ensure things are improving and you are making the right kind of investment. Once the migration is underway and the load on the target infrastructure is increasing, it needs to be carefully monitored to guarantee that responsiveness remains at the piloted levels. uberAgent helps with all of the above. Die Mobiliar found it to be easy to use while providing comprehensive information about everything that matters in a Citrix environment. uberAgent is a user experience analytics and application performance monitoring product. 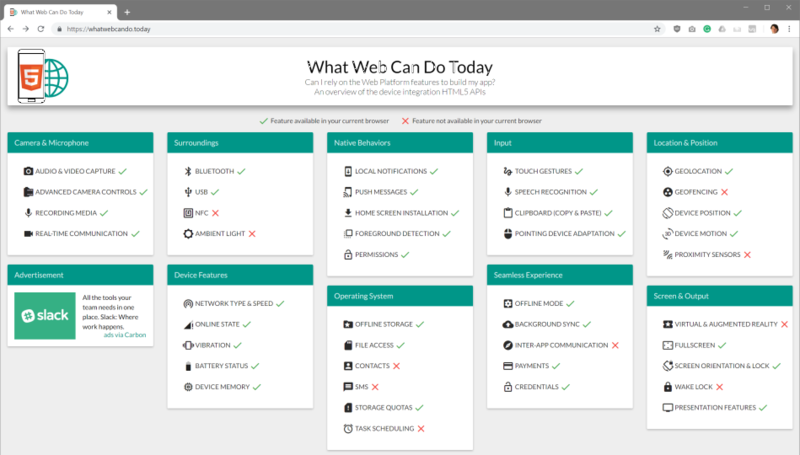 Its highlights include detailed information about boot and logon duration (showing why and when boots/logons are slow), application unresponsiveness detection, network reliability drilldowns, process startup duration, application usage metering, browser performance per website and remoting protocol insights. vast limits GmbH is the company behind uberAgent, the innovative user experience and application performance monitoring product. Our customer list includes organizations from industries like finance, healthcare, professional services, and education, ranging from medium-sized businesses to global enterprises. vast limits’ network of qualified solution partners ensures best-in-class service and support anywhere in the world. Our founder, Helge Klein, architected the user profile management product whose successor is now available as Citrix Profile Management. In 2009 Helge received the Citrix Technology Professional (CTP) award, in 2011 he was nominated a Microsoft Most Valuable Professional (MVP), in 2014 he was a Splunk Revolution Award Winner, in 2015 he became a VMware vExpert. Helge frequently presents at conferences and user group events. The post Practice Guides on Driver Inventory and Citrix ADC Alerting appeared first on uberAgent. Practice guides show how to use uberAgent in real-world scenarios. Each practice guide tries to answer a specific question. Customers are encouraged to look at the solutions presented in our practice guides and use them as a basis for their own implementations. Practice guides are part of uberAgent’s documentation. This practice guide shows how to collect information on drivers, including vendor & device names and driver versions. The guide lists several techniques. Some of them can be used to collect information on all drivers that are installed, while other examples demonstrate how to filter for specific manufacturers. The post Resources for Learning uberAgent & Splunk appeared first on uberAgent. The post uberAgent 5.2: Firefox Browser Performance & Citrix ADC Monitoring appeared first on uberAgent. The post Why Monitor Web Apps & Browsers? appeared first on uberAgent. The post Offsetting our Company’s CO2 Emissions appeared first on uberAgent. Do you have children? Many of us vast limits employees do, and that makes us even more concerned about humanity’s future on this planet than we would otherwise be. A child born today, in 2018, might well live beyond the year 2100. If that does not ring a bell: 2100 is the year that many climate change projections use as “end date”. 2100 seems to be so far away that a temperature increase of two, three or four degrees cannot really matter – or can it? Humans have a problem with scale, and especially with long timescales. 2100 seems to be so far off – yet it might be the year your grandchildren are the age you are today. What kind of world do you want your grandchildren to live in? Rising temperatures not only cause increased weather extremes, including heatwaves, droughts, floods, and fires. Rising temperatures also affect society, and not in a good way. New areas of conflict will emerge. Water will be precious in more areas. People will be fleeing from their homes, possibly causing a new migration crisis. Climate change can hopefully still be managed. A lot can – and needs to – be done today. The best thing, obviously, is to prevent CO2 from even being released. Looking at personal CO2 emissions, plane rides often stand out. For example, a trip from Frankfurt to Los Angeles emits approximately 5 tons of CO2 into the atmosphere, nearly 5 times as much as the average German household per person per year! This kind of inefficiency at the expense of our children and grandchildren cannot go on. At vast limits, we are committed to using the most efficient transport available, preferring trains and other types of public transport. But that is not enough. We take our responsibility versus our children very seriously indeed. Avoiding CO2 emissions completely, unfortunately, is not possible today, but something else is: removing the emitted CO2 from the atmosphere. The best way to do that is to plant trees. Trees take carbon dioxide out of the atmosphere, releasing oxygen instead. Trees use carbon dioxide to build their trunks and leaves. Used cleverly, trees also provide a sustainable income for local farmers. Reforestation instead of deforestation. How to support that? 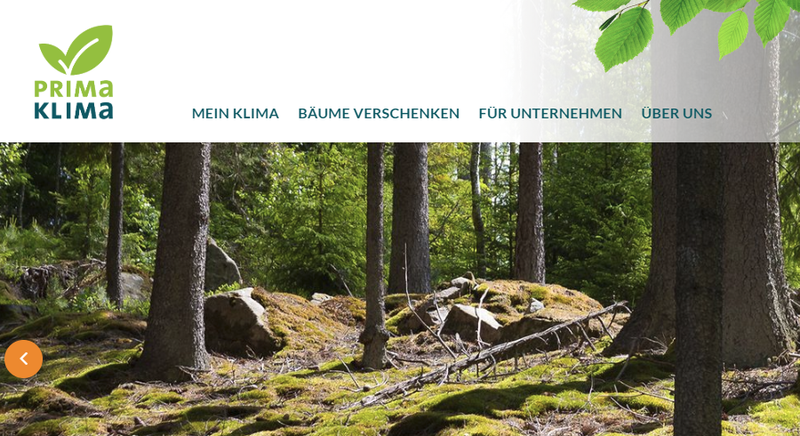 As it turns out, there is an organization in Germany that does exactly what we talked about above: planting trees and supporting local farmers to remove CO2 from the atmosphere: PrimaKlima e.V. As vast limits, we are supporting PrimaKlima e.V. by not only donating the amount required to offset our company’s activities but also all our employee’s households’ emissions, too. Of course, we cannot not determine all our households’ CO2 emissions exactly, so we used the 2016 German average and added 50% on top, just to be on the safe side. PrimaKlima e.V. have many offerings for individuals and organizations, one of them being company forests. Do you think we should do more? Would you like to see a vast limits company forest? Let us know in the comments below. The post Top 10 Issues uberAgent Helps Identify in Minutes appeared first on uberAgent. The wealth of data collected by uberAgent may initially be a little bit overwhelming. There are so many useful metrics that the hardest decision may be which one is the most useful. This post should help. We picked the top 10 issues we see in the field and we show how to pinpoint each one of them in minutes with uberAgent. Logon scripts are great if they are well-written. They can be a major pain if not! The top stumbling blocks I saw in my former consultant job were drive mappings, copy jobs and sleep commands. I am sure you could add a few more to the list. uberAgent detects and lists every process that runs during any user logon. uberAgent shows when and for how long a process ran, the process’ parent and its command line. Just the information you need to troubleshoot delays in logon scripts. Group Policy Preferences (GPP) makes mapping network drives comfortable by presenting a nice user interface, instead of having to fumble with logon scripts. However, if target servers are unavailable, logons become slow. The typical delay is 5-7 seconds – per mapping. Trying to map three drives to servers that are not available may easily cost your users 20 seconds. Every single time they log on or start a published application. This happens way more often than one should think it does. uberAgent shows the duration for every CSE (client-side extension) that is running during a logon, including the one responsible for drive mappings configured with GPP. If you see very high numbers here, there is most likely a problem with the target server. As a client/server application, Outlook constantly communicates with its backend Exchange servers. If an Exchange server is overloaded and cannot respond in a timely manner, Outlook has to wait. For the end user, it appears as if Outlook was slow where in reality the backend is causing the delays. The time it takes Outlook to send data to its backend server and getting the answer is called network latency. uberAgent’s application network communication metrics include the latency for every target. If the latency to one target is high, that target is overloaded or has other kinds of problems. Missing firewall activations are a favorite topic, especially in large companies. When an application does not work and you are calling the firewall guys you will often get “the port should be open” as a response. It never is! uberAgent shows application network issues including failed connects for every target and port. Now you can prove that the port is not open! We know uberAgent is not the only agent on your systems. You might already have a backup agent, a software deployment agent, an anti-virus agent and so on. That is why we come with a small footprint! The more agents and services you have, the more is written to and read from the storage during daily work but especially during boots. That means a lot of storage IO which results in slow boots. uberAgent collects detailed IO information for every process running during any machine boot. It even shows which drivers and services cause delays. This functionality makes it possible to identify agents and other software components that cause delays at a glance. You can find tons of articles out there on how to properly size Citrix environments. Even experienced engineers often fail in this space. Without proper sizing, you are likely to spend more money than necessary and spend part of it on things you do not need instead of investing it where it really improves performance. 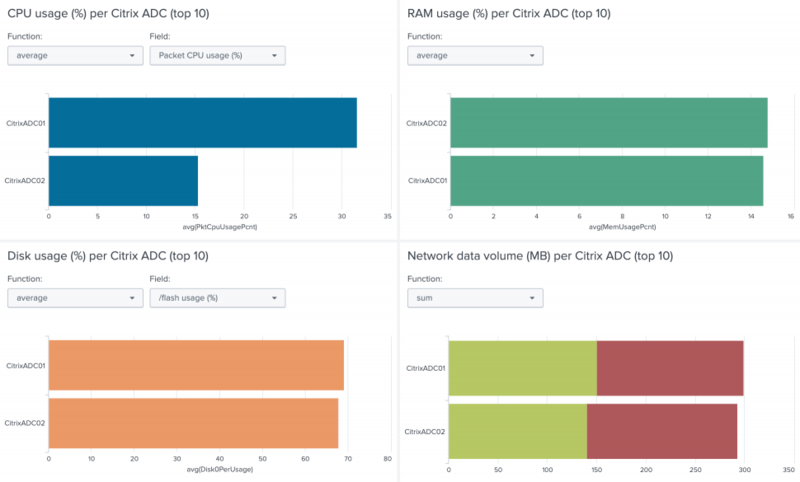 uberAgent has a dashboard solely for sizing Citrix sites which shows the average load for CPU, RAM, disk, and network. Based on these numbers you can identify the bottleneck in your Citrix site and invest money where it really improves performance. 7. Which Applications are Actually Being Used? You know exactly which applications are installed on your endpoints, right? Of course, you (should) have a software deployment tool which shows that. But do you also know which of them are actually being used? It is not unlikely that your organization is maintaining dozens or even hundreds of applications that no one ever runs. We need to test our applications prior to the migration to a new OS. For starters, how many different applications do we have? We are ordering new servers for application A. We need 1 CPU core per user – how many cores do we need in total? By the way, uberAgent also has an application inventory functionality. 8. Which Web and SaaS Apps are Actually Being Used? Now that you know which applications are really being run by your users (see point 7), do you also know to which percentage they are working in the browser and with which apps? These days, web apps have nearly the same capabilities as native Windows applications, hence they should be monitored in the same way. With the help of browser extensions, uberAgent shows which web apps are used how often, for how long, and how slow (or fast) the web pages are loading. 9. 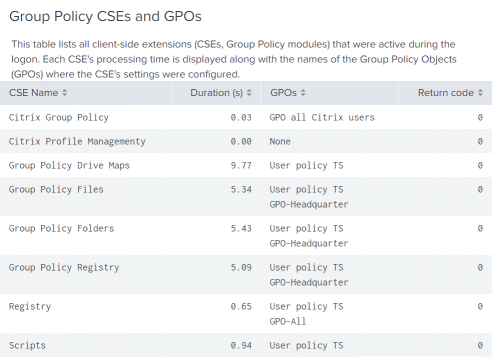 Which Citrix Workspace Client Versions Do You Have? Citrix releases new versions of Workspace client (formerly Citrix Receiver) faster than new versions of Virtual Apps and Desktops (formerly XenApp & XenDesktop). It is quite likely that you have different ICA/HDX client versions in the field which makes troubleshooting unnecessarily difficult. Some users are complaining that your line of business application crashes from time to time. For other users, the application runs fine. These are everybody’s most “loved” helpdesk tickets. Good luck calling all your 20,000 users asking which version they are using right now. uberAgent provides important information about application hangs and crashes that is not available in the Windows event log. For every hang or crash, uberAgent not only records the process name, faulting module, and exception code, but also the application version, the username and the process lifetime. This concludes our list. Do you have other stories how uberAgent helped you? We would be happy to hear about them in the comments! 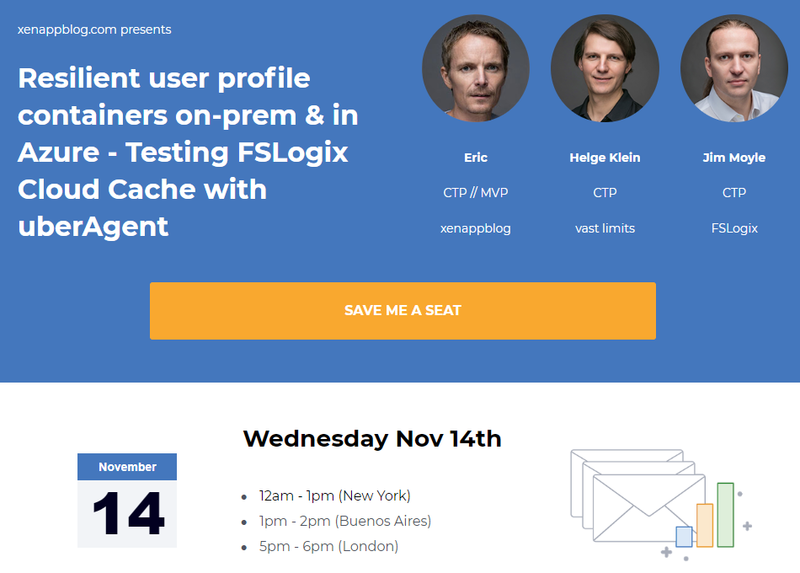 The post Testing FSLogix Cloud Cache with uberAgent on Multi-User Windows 10 appeared first on uberAgent. In this webinar CTPs Helge Klein and Jim Moyle will take multi-user Windows 10 for a spin, the new OS version that supports multiple concurrent remote sessions Microsoft is basing its Windows Virtual Desktop offering on. Windows Virtual Desktop, currently in preview, offers a multi-user Windows 10 experience from Azure. In addition to Windows 10, it supports Windows 7 and Windows Server 2012+. Microsoft 365 E3, E5, or F1 customers can access Windows Virtual Desktop for free. In a world where apps and desktops are alternatingly hosted in the cloud and on-premises, user state management can be challenging. FSLogix Cloud Cache offers an elegant solution that provides flexibility and resiliency with truly location-independent user profile containers. Hybrid clouds become complex quickly. To deal with that, IT needs the visibility that uberAgent brings to the table. With its user experience and application performance analytics capabilities, uberAgent is the monitoring solution for the modern workspace.